Ask yourselves the questions below, and if the answer is yes to anyone of them, then you most definitely need to read this book. 1. Have you received summons about a CrPC 125 or DV case filed on you by your wife? 2. Has your wife left your home (for 2nd or 3rd time maybe), and there are signals from the other side about threat of cases. 3. Has your wife been to police station or even called them to complain about you? 4. Do you live in an abusive relationship, where no matter what you do, wife is never happy with you, or/and your parents? 5. Has the word ‘divorce’ been mentioned between you and wife, or from your in-laws? 6. Your wife has lived with you for less than 50% of the time you have been married, and for no genuine reason like jobs in different cities etc? 7. Did wife’s relatives come one day and took all her stuff (jewellery, clothes etc) from your house? 8. A case like IPC 498A, 406, 323 is already filed on you/your relatives? If you answered yes to any of the questions above, then you need to prepare RIGHT NOW on how to handle maintenance cases from wife? But my wife said we will go for mutual divorce without alimony! Gentlemen, that point has been told to us many a time before by husbands who trusted their wife at face value, and later had to face multiple cases from wife including IPC 498A. That assurance is usually given to lull the man into a false sense of confidence, and then hit him hard with the usual maintenance and even criminal cases. It is all being planned, just that you will be the last to know! Why worry about maintenance cases, why not get divorce and finish all these cases? That is usually heard from men who haven’t yet received the ‘demand’ notice from wife/in-laws. Let’s give you the breaking news even before your in-laws do. Their demand to give you divorce will be anywhere from 20 lakh to 2 crore, and maybe throw-in one property too especially if a kid is also there. Whether she stayed at your house for 1 day or for 10 years, the demand will not be any less! And even if you are ok with just living separately, she can still lay a claim to get monthly maintenance from you. Does that reduce your worry, or increase it? I am ready to give divorce, but I don’t know what they want! That’s a common situation for many husbands whose wife has left them, but neither does she want to come back, nor does she file for divorce. Let’s clarify one thing for every reader. If your wife prefers to stay at her parents’ rather than your place, and you want to know why… Well, here it is: “It’s all about Money, Honey!”. These days unscrupulous women have become a bit sophisticated (or so they think) by not filing any case on husband initially, but just sitting at parents’ house for many months at a stretch. Usually the husband gets frustrated, and depending on previous experience of marriage, he either sends a RCR or a divorce notice to wife. Whether you filed RCR or divorce, it doesn’t matter, the game begins right then, and maintenance cases under CrPC 125, DV Act, or even HMA 24, is an essential part of the game. They will get an order for monthly maintenance while you keep fighting in the courts for years trying to prove the merits of your RCR or divorce petition. You can crib all you want: “How is it possible that wife can get maintenance when she doesn’t even stay at husband’s house!” But that’s how the laws are written: Wife asks for money, man has to pay! It’s your problem to prove to court that she has left you without a good reason, or it’s her fault. And most of these laws are made by men, so if you believe in male superiority or male dominated world, you have to ask the question: “How could these men be so stupid?” Well, usually the lawmakers don’t have to bear the brunt themselves, so as long as you keep voting for them, they will keep passing such laws. Men’s taxes, men’s vote, men’s persecution! This book is written from perspective of informing Indian men on how best to handle maintenance cases filed by wife, and how to deny or reduce the maintenance amount. The focus is especially on men facing or likely to face multiple cases foisted by wife including IPC 498A, 406, 506, 34, 323 and others. Also, it will be useful for men who have filed RCR/divorce or wife has filed same on them, and now she has filed a maintenance claim under HMA 24. Handling maintenance cases of wife is a universal feature of all above scenarios, but unfortunately it is somewhat ignored in the initial stages by men with the result of getting burdened by high maintenance, and still having to fight cases for many years in court. Fight interim maintenance and maintenance like your life depends on it! One of the main points of the book is that fighting and denying/reducing maintenance is the most important thing which needs to be done by husbands, to gain upper hand in the overall fight. It is much more important than fighting 498A/406, other IPC sections, divorce/RCR etc, which take much longer time anyway. 1. Understand what is maintenance, the need for it, and the history behind it. 2. Develop a a cool, calculated, unemotional approach to win the game, rather than betting on emotional responses like: “I will not pay a penny, and see what happens”. 3. Understand why reducing interim maintenance and final maintenance are the most important things to do in overall fight. 4. Explore the bare act of CrPC 125 and understand its main points and their implications. 5. Explore the bare act of PWDVA (DV Act) and understand its main points and their implications. Understand the concepts and implications of shared household, residence order, protection order, monetary relief, compensation, ex-parte order, maintenance under DV Act etc. Learn the techniques on how to thwart these or minimize the damage. 6. Should you sell your house to protect it from falling into wife’s hands? Should you transfer the house to your mother’s name? 7. Understand the process of summons and other court procedures in maintenance cases. 9. Find out what evidence to collect, and which evidence is most important to deny or reduce maintenance to wife. Using CrPC 91 to get wife’s employment records or bank statement etc. Reducing own income in hand. Getting parents to file CrPC 125 on husband to reduce in-hand income. 10. Some common myths to avoid in fighting maintenance cases – like leaving one’s job or filing RCR. 11. 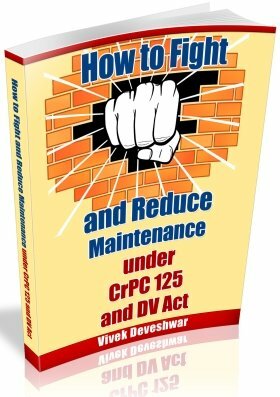 Go through important judgments/precedents about maintenance ordered under CrPC 125 and DV Act. Some judgments of HMA 24 are also covered to explain about maintenance principles, though discussion of HMA 24 is not in scope of this book. 12. The judgments on maintenance are divided into sections based on whether one’s wife is working, qualified but left job, qualified but never worked etc. 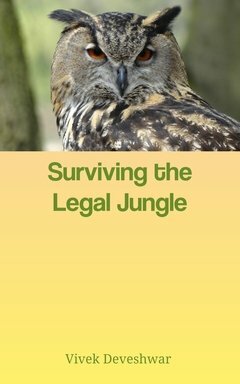 An easy approach is given on selecting the appropriate judgment closest to the facts of your own case. Finally, the appendices contain full bare acts of CrPC 125, PWDVA, PWDVA Rules, and Family Courts Act for easy reference. On Notion Press bookstore in Print (Paperback) version. On Amazon store as a Kindle book readable on any PC/laptop, tablet, smartphone (Android or iOS) or mobile with Kindle app. Of course it can be read on a Kindle e-Ink reader also, but that’s not a requirement. 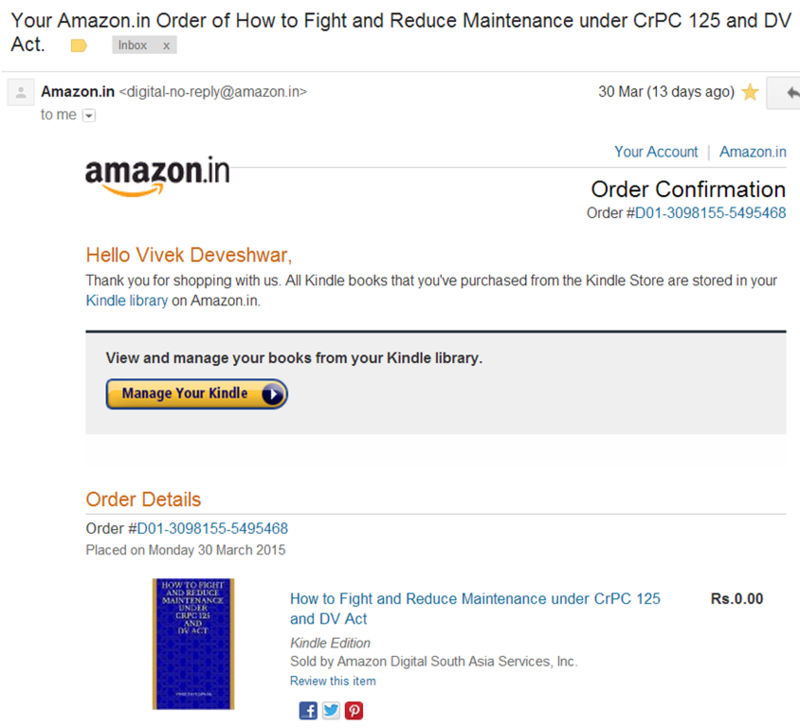 Remaining part of article below covers common questions about Kindle eBook version. What is the best device to read the Kindle eBook on? If it’s a book to immerse in and read page after page without skipping things, then Kindle e-Ink reader is best since it doesn’t cause any eye-strain and is suited to page by page reading. But it’s not suited to searching something quickly, or jumping to an arbitrary location within the book and then jumping back to same location where you were reading earlier. If I have already read a book and just want to refer to some specific point in it again, or search for particular words, then Kindle desktop app on laptop/PC is best for quick searches as well as page scrolling. If I want to utilize my time while waiting somewhere, then having a book loaded on Kindle app on mobile is a good way. Bigger the screen size, the better. 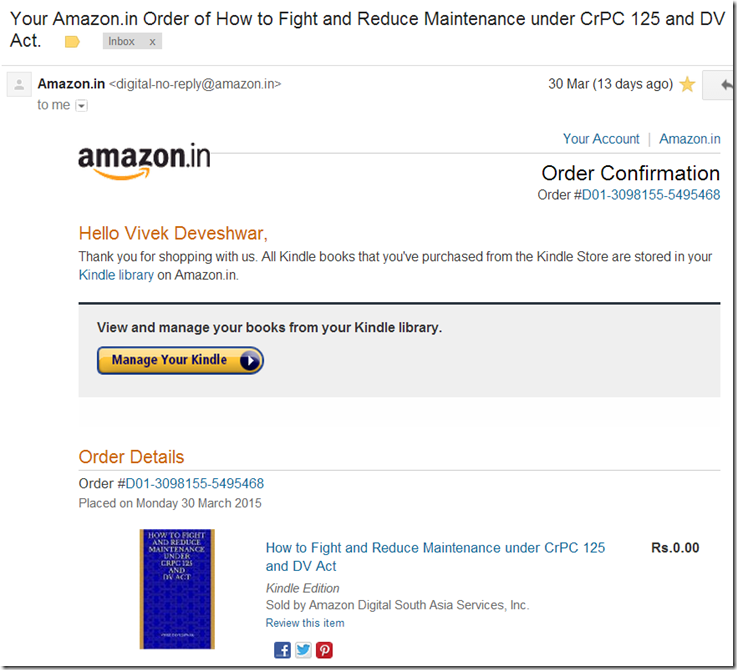 Kindle cloud reader (from any browser) at https://read.amazon.com/ is also an option though I don’t use it much myself. The best thing about Kindle apps is that if you were reading at a certain location within one device, and later continue reading from another device; it will take you to the location/page where you left off on the previous device. All that is required is that you sync up on Kindle app before switching to another device. How to pay for the book? Internationally-enabled personal credit and debit cards (Visa, MasterCard and American Express) issued outside India. How to read the book on PC/laptop? The instructions will be given at Amazon and at purchase page itself. However since some people don’t have experience with Kindle books, I am giving the download links below. If you still face any problem in purchase or reading of the book, feel free to contact me. Did you face any problems in ordering or downloading of book? For download and reading of book, please refer to above sections about How to read the book. If you are able to read the book sample, then it means your Kindle app is already setup properly. Reading the whole book should be no problem either, once you make a purchase. Note: the price above is shown as 0.00 because on that day it was given away as a free book (I ordered it just to test). In your case, it will be the price you actually paid. Search for amazon.in or digital-no-reply@amazon.in in your email to quickly find that email. If you do not find any such email, then most likely the order never went through. You can also check the Order History page at Amazon.in to see if the order was successfully placed or not. If it is not here, then it didn’t go through. Check if your credit card, debit card, net banking has already been debited. If so, you will have to contact Amazon.in customer service about the order.